For decades, black female athletes have faced criticism, inequality, lack of support and unrealistic societal expectations. Although there has been progress, it hasn’t been enough. On Nov. 13, Andrews appeared on a panel with WNBA player Nneka Ogwumike and Penn State professor Amira Rose Davis at Morgan State University in Baltimore to discuss the struggles of black female athletes. The discussion was part of a collaboration between The Undefeated and Morgan State to study the history and image of black women in sports. Earlier this year, Morgan State faculty produced a study, Beating Opponents, Battling Belittlement: How African-American Female Athletes Use Community to Navigate Negative Images, that examined the history of black women’s participation. It identified cultural factors such as attitudes about body image that interfered with the ability of black women to succeed and coping methods that they continue to use today. Davis, whose academic work focuses on race, gender and sports, said the cultural conversation surrounding black female athletes has shifted in part from what women have to look like to participate to what they have to look like to be endorsed. Davis pointed to the example of professional boxer and two-time Olympic gold medalist Claressa Shields. Davis talks about a moment in T-Rex: Her Fight for Gold, a documentary about Shields, in which she complains that she received virtually no endorsement deals after her gold medal wins. Both Andrews and Ogwumike recounted instances of support as well. Andrews recalled a day when she went 0-for-3 at the plate but a young African-American girl still declared that Andrews was her favorite player. Ogwumike told an anecdote about being in the airport with her Los Angeles Sparks teammates and encountering two young white boys who were thrilled to meet them. 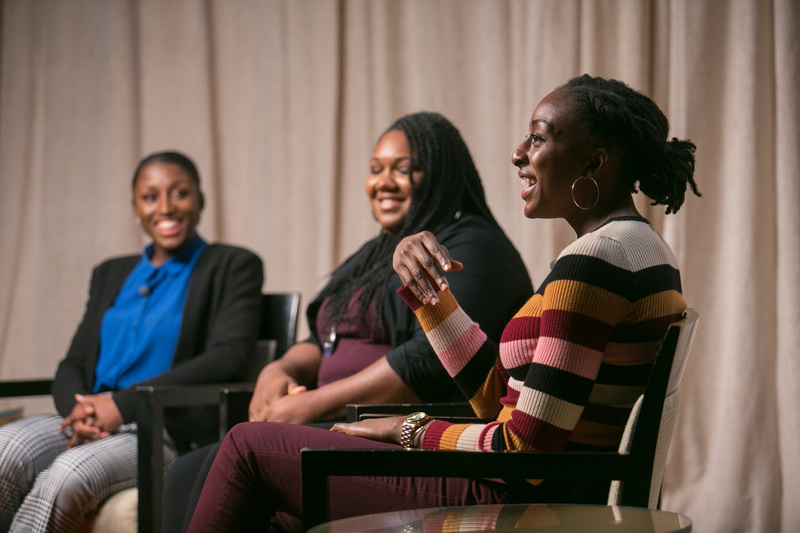 The Undefeated hosted a panel discussion on black female athletes Nov. 13 at Morgan State University with A.J. Andrews, a pro softball star (left), Penn State professor Amira Rose Davis (center) and Nneka Ogwumike of the Los Angeles Sparks (right). All three women talked about how they need to be catalysts for the changes they wish to see, whether it be better pay for female athletes or more opportunities for black women on the field and in other sports-related jobs, from coaching to broadcasting.